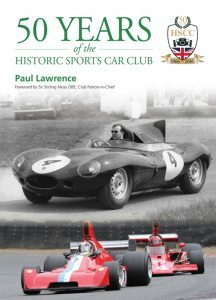 A substantial new book has been launched to celebrate 50 years of the Historic Sports Car Club. The hard-back book has been written by motor sport journalist Paul Lawrence and tells the complete story of the HSCC form the inaugural Griffiths Formula race at Castle Combe in 1966 through to the end of the Club’s 2016 championship season. The book comprises 256 pages and has 580 photographs, many never previously published. The foreword is from Sir Stirling Moss OBE, the Club’s patron-in-chief. The Club’s story charts the highs and lows of what is now Britain’s leading club for historic racing. The story moves from the HSCC’s modest early days to becoming a race organising club in the early 1980s and the influence of the late John Foulston. After difficult financial times in the 1990s, the Club has prospered over the last two decades and now has a prominent and respected position in historic racing. The book also tells the story of the competitors who have raced with the HSCC over 50 years and includes records of all the Club’s championships and annual award winners. The book is priced at £30 plus £6 postage and packing to UK addresses and can be ordered from the HSCC office on 01327 858400. HSCC members and marshals can order copies at the discounted price of £20 plus £6 postage and packing to UK addresses. For postage to addresses outside the UK please contact the HSCC office.